Classic Italian pistachio paste used in the preparation of italian ice cream and desserts. 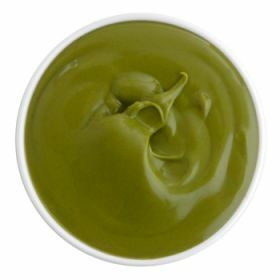 This paste is a mix of almonds and pistachios with addition of chlorophyll for color. Use suggestion: For ice cream add 60-100 g of paste per liter of ice cream mix (8 to 13 oz. per gallon). Ingredients: almonds, sugar, dextrose, pistachios, peanut oil, flavorings, starch, colors E100 (turmeric), E141 (copper complexes of chlorophyll and chlorophyllins). May contain traces of milk, egg, soy and other nuts.